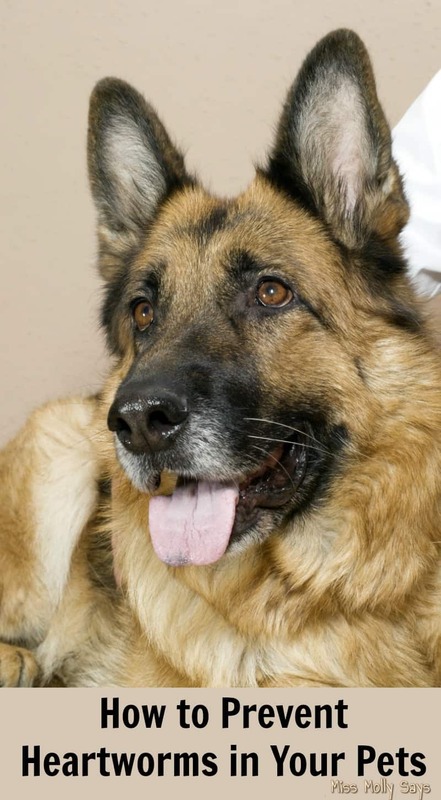 If you have a pet, you likely know about heartworm prevention medicine. And, if you’re planning to get a pet for the first time, the idea may be new to you. If you are, or are planning to become, a pet parent, then it’s essential that you understand how pets get heartworms, what heartworms do, and How to Prevent Heartworms in Your Pets! Heartworms are, as their names imply, a worm. They’re a type of roundworm that live in pets’ hearts and can even live in their lungs. If you’ve ever seen a picture of heartworms, they’re pretty disgusting. They’re not like short, fat earthworms. They’re long and white, like string or noodles. Imagine having something like that inside your heart! Pets get heartworms via mosquitoes. If a mosquito bit an infected animal (including wild foxes and wolves), then bites your pet, they can transfer heartworm larvae into your pet. Obviously, having a long noodle creature burrowing its way through your heart can’t be good for you. And mature heartworms can live for years! If left untreated, heartworms can kill your dog or cat as they slowly damage their heart. Until that time, your dog or cat may cough a lot, become lethargic, not want to eat, and may lose weight. They may also faint or have seizures. Along with a lot of danger to your pet’s health, heartworms pose a serious danger to your wallet. Diagnosing heartworms requires several tests, which can be pricey. Once diagnosed, a dog requires several injections to kill the worms. You may remember when we adopted Seager he came to us with a bad case of heartworms and had to go through heartworm treatment. The injections are very painful and it is a long recovery time. There is no treatment for heartworms in cats, aside from surgery, which means that in most cases they’ll need medicine for their symptoms and will have to see the vet often to check on the progress of the disease while you wait for the worms to naturally die out. In the end, heartworms can be a major veterinary expense, along with a stressful time for you and your pet. Since it’s impossible to keep mosquitoes away from your pets, even if they live indoors, the only way to be sure to prevent heartworms in your pets is by regularly giving them heartworm preventative medicine. There are many different medicines available, made up of different chemical formulations and with different price points. The medicines for cats are different from the ones for dogs. Pet heartworm preventatives include Interceptor, Trifexis, Heartgard, Revolution, Sentinel, and others. When choosing a preventative, consult your vet, but also do your own independent research. Don’t just choose whichever medication you find a flyer for in the vet’s office. When Trifexis first came out, it was being heavily marketed in vet’s offices, but at the same time pet parents were complaining about serious side effects. So make sure to do your own research. Remember, you get what you pay for. If you find heartworm preventative for a super cheap price at Walmart, it may not be as effective as it needs to be. And just because the weather is cooler or cases of heartworm are low in your state doesn’t mean you can skip giving your pet heartworm preventative. If you want to prevent heartworms in your pets, it’s better to be safe than sorry! What heartworm preventative do you give your pets? Heartworm Treatment for Seager is Going Good! Woo Hoo! Seager is Finally Heartworm Free!